Dr. Michael Lange is an optometrist, certified nutrition specialist, and founder of Lange Eye Care and Associates, opened March 15 1993. Dr. Lange opened 13 Lange Eye Care locations in Florida between 1993 and 2016. In 2016, he sold all of his locations except the Lange Eye Institute in The Villages, Florida, the most advanced and largest of his eye care centers. Dr. Lange sees patients at the Institute Monday-Friday and has incorporated the latest in optometry and ophthalmology at this location. Patients come form all over the country to see Dr. Lange for the very latest in nutritional eye care. 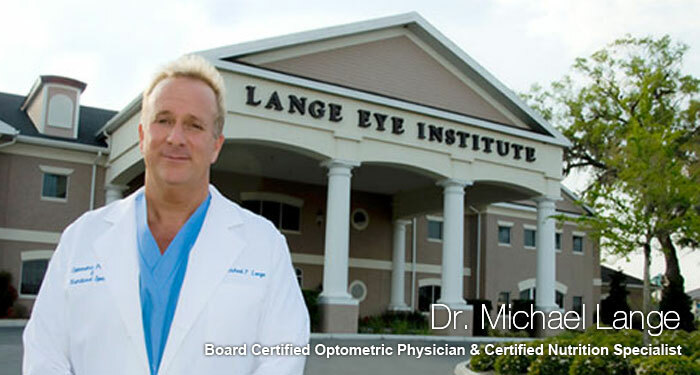 The Lange Eye Institute also has the latest in surgical, medical and optical eye care. Dr. Lange has put together a great team of specialists in all areas of eye care including retina, oculoplastics, cataract, glaucoma, cornea and neuro-ophthalmology. The Lange Eye Institute also specializes in difficult contact lens fittings. Dr. Lange and his associates fit hybrid and sclera contacts on very difficult corneal cases with great results. Dr. Michael Lange is the CEO of Fortifeye Vitamins and Paleo Simplified, both of which are involved in research and development of nutritional supplements and whole food bars and granola to enhance overall health.